There has been significant lop-sided media coverage on recent shootings of ‘unarmed’ subjects, especially those armed with non-firearm weapons. Apart from the howls of racism, much of the focus, particularly stateside, has been on distance between combatants and the ensuing time (and number of shots) needed to stop the unfolding threat. The Las Vegas Police Department has decided to include de-escalation techniques in use-of-force training. There are two major issues with deadly threat situations: a basic deficiency in the public understanding of the use of lethal force (and possibly) a lack of training in how to make critical decisions in deadly force calls. To help save the lives of people who are in essence committing ‘suicide by cop’ by buying time for the use of additional tactical options. The racial fence appears to be growing higher by the day. The Michael Brown shooting and, to a lesser degree, the proximal St. Louis shooting of Kajieme Powell, (which unlike the Brown shooting, was caught in its entirety on video) has brought the issue of police use of deadly force to the forefront for discussion. Does the assailant have a weapon capable of causing grievous bodily harm or death to the officer or others? Was the assailant ordered to drop the weapon and did they do so? Did the offender keep advancing? This simple check list does not account for all situations encountered on the street. Could more be done to spare a life? When shootings have an appearance of being deserving and post-shooting actions reflect lifesaving care, not disdain for the offender, public trust and confidence in the police can be maintained despite the tough circumstances for both the police agency and community. The family of the ‘victim’ seldom back deadly police actions. Body cameras are a technological advancement that will do much to show the stark realities of deadly threats that officers must face. In time, and with public education about the handling of potentially deadly threats, the divide between police and the public may shrink. Whether so stated or not, some people are hell-bent on killing themselves by attacking police and often there’s little that can be done to prevent those sorry outcomes. There is always the possibility of using less-lethal options, but only if they are actually available at that moment, using them does not jeopardized officer lives and lethal over-watch is in place. Even the appearance of trying to spare an attacker’s life can go a long way to quell the notion that police are murderous, racist, uncaring thugs, because nothing could be further from the truth. Furthermore, attempting to save the offender’s life after the threat has been neutralized can go a long way in appeasing the critical eye of the public. Making every effort to provide swift medical attention, ensuring that ambulance assistance is a priority (and radio traffic shows this was the case), even if all these efforts are done in the face of a grim prognosis, is much better for the officer, the critical public and, most importantly, ensuing legal proceedings. To be clear, I strongly advocate using lethal force to stop deadly threats and do not favour seeing police officers hung out to dry (“thrown under the bus”) merely for protecting themselves and the public. If a ‘man with a knife’ can get close enough to an officer, he certainly has the potential to injure or kill, regardless of whether he is bleeding from gunshot wounds, mentally ill, an upstanding, church-going family man or what have you. Officers cannot merely take a single shot and then assess the damage, if any, to the person charging headlong at them. It’s very difficult to hit a moving target anywhere with a handgun under extreme stress and there’s no guarantee the shot will drop a person instantaneously. Taking cover is therefore a prudent tactic even when confronting an inferior weapon. Officers should move to find cover, if possible, to stay safe. Once the survival process of pulling the trigger to stop the threat has begun, it is impossible to instantly stop shooting. Making the decision to shoot, to actively pull the trigger, to assess the results, to decide to stop shooting and to physically stop pulling the trigger all take precious fractions of seconds to unfold. This adds up to the possibility of ‘extra’ rounds being fired by an often adrenalized officer in fear for their life. These brave public servants deserve to go home to their families and to be supported by the public. Some of the ignorant or misinformed members of society say police should risk a close quarter combat lethal encounter, use a lesser weapon, shoot the knife out of the attacker’s hand or otherwise stop them with a well-aimed leg shot. They must be educated about the huge difference between what is done by fictional characters portrayed in television and movies and what is actually possible in real life (and death) on the street. When responding to ‘man with knife’ calls officers should consider pulling up well short of the subject to automatically build up a functional reactionary gap (buffer zone), seek immediate cover (their patrol car is an obvious choice) or consider a tactical retreat, if possible, for protection from the obvious threat. First responders arriving on foot should immediately look for cover to negotiate from. This is not to say officers should shy away from their duty of protecting the public if there is a risk to safety that would likely preclude disengagement. However, if the situation permits, using a barrier to ‘hide’ behind should not be viewed as an act of cowardice but as a tactically savvy strategy when discretionary time is available. Assess the situation and decide what to do about it as dispassionately and expeditiously as possible. Negotiate with the possibly suicidal (by cop) party. Deploy less-lethal response options (if available) over the top of, or around, the adopted barrier. Create precious time for additional resources (including less-lethal response options) to be brought to the scene by nearby back-up officers (if available). Choose a safer backdrop for discharging a firearm while the surroundings are physically panned. Think more clearly from behind the safety of solid cover. Some officers may tend to stand out in the open because they believe their superior weapon can effectively deal with the threat posed. They may feel reluctant to back away and are essentially using their firearm as a form of ‘cover.’ Some police are trained to look for cover when dealing with edged weapon threats; shooting knife wielders upon first contact is less likely to happen. Many officers wait in the open until it’s almost too late to defend themselves. Indeed police often underutilize force even when legally authorized to use it. They would likely be even more reluctant to do so in this hypercritical climate of the current witch hunt against police who use force and the omnipotent gaze of the iPhone paparazzi. Let them video away. The perp usually drives the need to use force and can make it stop at any time simply by complying with commands. Take cover or not, the end result may be that the knife-wielder is shot but this deadly game has more far-reaching ramifications than a person dying, as tragic as that is. Think of an officer’s career and personal problems stemming from the stress levels and concomitant years of investigations, inquiries and other legal proceedings. What about the social, financial, emotional, reputational and community struggles the officer and agency have to deal with long after the gun smoke clears? On the other side of the fence, what about the ramifications for the deceased person’s family? How does the video (often now arising far more often, even from police-worn body cams) appear to the community? A person brandishing a blade and stalking police is not thinking clearly. Can the outcome of “bringing a knife to a gun fight,” and the optics of the subsequent shooting, be influenced in a more positive way? Have you ever tried chasing someone around a full-size car? In 2007, shortly after I retired, I intervened to assist in ejecting an individual from a 7-11 store. He pulled a knife and attempted to chase me down. I kept him on the other side of a parked vehicle and immediately called 911. My would-be assailant soon realized that he couldn’t catch me as we each had an equal ability to run around the vehicle. I acknowledge that some officers work alone in rural settings, totally isolated, standing on frozen ground on highly uneven terrain, without nearby back up, etc. The consequences of tripping and falling could be far more serious than merely losing a stable platform from which to defend yourself. There are certainly many situations in which allowing yourself to be actively stalked by a knife wielder (for the sake of exhausting every possibility) rather than immediately shooting would not be tactically prudent. Roll back the surveillance video to determine if taking safe cover was possible but not utilized against a relatively drunk man with a knife who was unsteady on his feet. Which scenario would have resulted in fewer repercussions for the officer, the community and in court: the officer openly standing in front of nearby cover and shooting after commands to drop the knife failed, or the officer taking cover and trying to talk him down, calling for less lethal options and otherwise delaying direct lethal engagement of the threat? Several problems would have been resolved in the St. Louis shooting had officers taken a position of cover behind their police car rather than driving right up to and openly facing the deadly threat that Mr. Powell presented. It’s all about options and optics; creating more time allows for more options to be considered, making the optics of any shooting less painful to view and easier to support by a concerned and often highly-critical public, the courts and use-of-force oversight boards. How much less justification would officers have had to do to the judgmental public and overzealous scrutinizers had they challenged him to drop the knife from behind physical cover? Directing Mr. Powell to drop his weapon from behind the ‘cover’ of their sidearms looks far different than doing so from behind a vehicle. Police do not have a duty to retreat (unless they choose to do so for tactical reasons) but standing out in the open in front of a mentally ill, drug-impaired or enraged person is not a tactically sound position to take when cover is available. If attempts to communicate fail, that exposed position would likely eliminate any other possible option BUT to shoot. Is it ‘justified’? Probably. Is it absolutely necessary? Maybe, maybe not. Taking cover, a basic police tactic used against individuals armed with a firearm, is a strategy worth considering in dealing with armed offenders who don’t have guns. Cause the subject to do more than just approach you. By trying to resolve the situation without the initial (and slightly delayed, if safe) use of a firearm against someone chasing you around a car (or other useful barrier) looks far better than shooting an armed subject who crosses an imaginary 21’ line. ‘Police-precipitated homicide’ (violence) encompasses the use of poor tactics, like failing to take available cover or getting unnecessarily or prematurely too close to a threat. This ultimately leads to a shooting because a fear of loss of life becomes an imminent reality. Using poor tactics can indeed lead to excessive or unnecessary force. The lack of situational awareness in not taking cover where feasible places an officer squarely in the ‘threatened for their life’ zone. The subject’s poor decision-making is compounded, not mitigated, hence the inevitability of a shooting. Sometimes when circumstances allow it, the job can be done in a slightly smarter and more ethical way, notwithstanding the offender may still end up being shot. It will just look better. As we know, ‘homicide’ is actually a neutral term meaning a death caused by a fellow human being. I was inspired to coin the term ‘police-precipitated homicide’ after watching several American police shootings of people with knives on freeways or city streets, where a line of officers with a multitude of firearms stood in front of a row of police cars used to block traffic. Invariably the emotionally disturbed, shirtless person runs or lunges at police and dies in an intense barrage of gunfire (often only seen on the firing line at the shooting range). Why didn’t these officers think to angle their line of fire off to the side of the highway and have an officer try to hit the subject with a squad car? Protect themselves from injury or death (and post-shooting liabilities and negative aftermath). More ably justify their actions (to the courts and the community). The time to address these issues occurs at the very front end of policing. It requires a collective effort by trainers to provide context and options for making better decisions in using deadly force and to build these skills into officer in-service training. Providing immediate medical assistance to the injured arrestee is also prudent considering that a video record of the encounter will likely exist. Whether it is regarded as covering bases or covering butts, ethically and tactically, making a tactical retreat while taking cover is simply the right and smart thing to do in these racially divided times. We need to tear down that problematic fence and put up a tactical barrier. Al Arsenault developed expertise in non-firearm weaponry, drugs and beat policing during 27 years in Canada’s most dangerous and challenging beat – Vancouver’s Skid Row. He co-founded the famed Odd Squad in 1997 and published Chin Na in Ground Fighting in 2006. He currently specializes in teaching police combatives through his co-founding of Police Judo in 2010, is writing a book on Police Judo and teaching the essentials of this new martial art to police across North America. 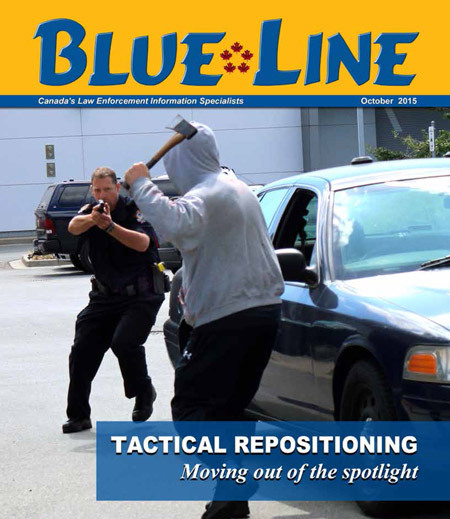 Tagged with tactical repositioning, blue line magazine article, police judo, real life application, judo. October 25, 2015 by toby hinton.